A new report by Fleet Carma has revealed volume deliveries of the Tesla Model 3 in Canada over the last two quarters have helped boost electric vehicle (EV) sales in the country to a new record high. Surpassing 13,000 units during the last quarter, EV sales now represent over 8% of new car sales in Canada (via Electrek). The start of volume deliveries of the Tesla Model 3 over the last two quarters made a big difference this year in Canada. Tesla delivered almost 5,000 Model 3 in the country over the past 6 months and the vehicle remained the best selling plug-in during the last quarter, according to Fleet Carma’s numbers. 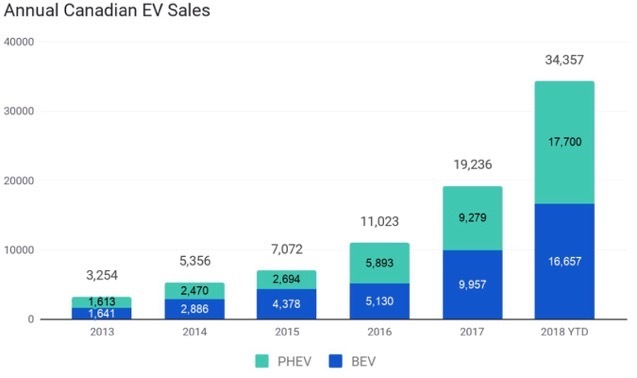 While Ontario ending its EV incentive program is expected to have a significant impact on the situation, as it has added more EVs than any other province in 2018, Quebec and British Columbia are, however, still going strong.